Ready to #dipanddunk. Share your chocolate adventure. Dip in. Simply heat and serve for a hands on chocolate dipping adventure. Dip, dunk and explore our selection of sweet and savoury treats in melting 40% milk, 70% dark and high-cocoa white chocolate. Pass the adventure on, cosy nights, parties and dinner dates. Messy is allowed. Milk Dipping Pot / White Dipping Pot / Dark Dipping Pot / Pretzels - salted and nibbly / Doughkie - a hint of olive oil and pinch of salt / Popcorn - coated in toffee/ Orangettes - zesty, pure orange/ Marshmallow - perfectly plump/ Ginger Sticks - fiery, warming ginger/ 6 Tongs / Serves up to 6. Always heat each chocolate pot individually in the microwave. Different grades of chocolate have different melting points, if melted at the same time it increases the risk of burning the chocolate. Remove the pots from the packaging and remove the film lid. For White Chocolate Pot:. Heat in the microwave for 1 minute. Remove from microwave and gently stir until all of the chocolate has melted. 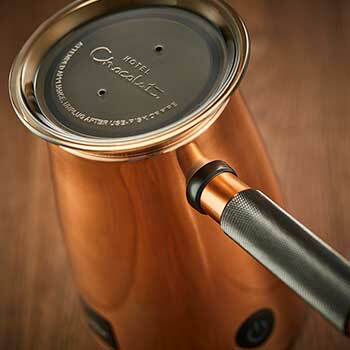 For Milk Chocolate Pot: Heat in the microwave for 1 minute 40 second. Remove from microwave and gently stir. Return to the microwave and heat for 20 seconds. Gently stir until all of the chocolate has melted. For Dark Chocolate Pot: Heat in the microwave for 2 minutes 10 seconds. Remove from microwave and gently stir until all of the chocolate has melted. Why not try adding fresh fruit such as banana and strawberries; or other nibbles like nuts, brownies and even crisps. After all most things improve with chocolate! 525.00 g / 18.50 oz. Milk Chocolate Pot Ingredients: Cocoa solids (cocoa mass, cocoa butter), sugar, whole MILK powder, emulsifier (SOYA lecithin). White Chocolate Pot Ingredients: Cocoa butter, sugar, whole MILK powder, skimmed MILK powder, emulsifier (SOYA lecithin). Dark Chocolate Pot Ingredients: Cocoa solids (cocoa mass, cocoa butter), sugar, emulsifier (SOYA lecithin), natural flavouring. Mini Pretzels Ingredients: WHEAT flour, salt, sunflower oil, malted WHEAT flour, yeast, acidity regulator (sodium hydroxide). Doughkie biscuit Ingredients: WHEAT flour, white wine (SULPHITES), olive oil, extra virgin olive oil, salt. Toffee Popcorn Ingredients: Sugar, glucose syrup, popped maize, rapeseed oil, butter (from MILK), salt, single cream (from MILK), invert sugar syrup, molasses, emulsifier (sunflower lecithin). Marshmallow Ingredients: Glucose-fructose syrup, sugar, water, pork gelatine, anti-caking agent (maize starch), natural flavouring. Ginger sticks Ingredients: Ginger, sugar, glucose syrup, WHEAT dextrose. Orange sticks Ingredients: Orange peel, sugar, glucose syrup, WHEAT dextrose. For allergens including cereals containing gluten see ingredients in bold. May contain traces of tree nuts, egg, sesame. Warning: Un-popped popcorn kernels may be present in product.